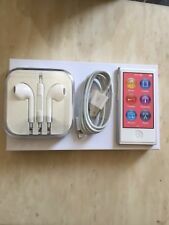 Apple ipod nano 7th gen 16gb Pink. Fully Functional. Condition is Used. Very nice condition, a few small scratches. Works great. Apple iPod classic 7th Generation Functions perfectly! Has some wear that I have included in the pictures. Does not come with a charger. Please message me if you have any questions. 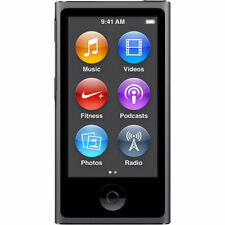 For sale is this 16gb 7th Generation Space Gray Apple Ipod Nano. Screen in good shape. 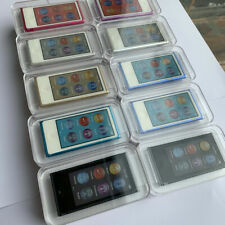 Apple iPod nano 7th Generation Blue (16 GB) - Fully Functional. The device has some wear and tear and a deep scratch on the screen. Works perfectly guaranteed! Shipped with USPS First Class Package. 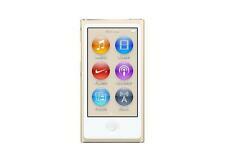 Apple iPod Classic 160gb Silver 7th Generation Model A1238. Condition is Used. Works perfectly! For sale is a mint,charcoal gray 160GB 7th Generation iPod Classic. New slim, custom black "160 GB" engraved backplate and new battery. Works great, no issues. Harddrive has been thoroughly scanned and is 100% error free (0 reallocs). Apple iPod Classic 7th Generation Black (120GB) used, minor scratches.